While our spiritual heritage ultimately harkens back to the times of Gautama Buddha and Lao Tzu, the Clear Mountain sangha traces its immediate origins to the Metro Zen Community, which was formed in 1998. A group of individual that gathered and met regularly sought to offer the Montclair, NJ vicinity the benefits of Zen sitting and teaching. The first year of zazen was held in the cellar of the home of founding member John Flynn (since deceased). Other founding members included Carl Bachmann, Deb Baretz, and Ray Cicetti. Before long, the group gained a new home at the Montclair Co-Op School, which was otherwise unoccupied on Sunday mornings. Several members of the group were also involved with the already established Morning Star Zendo in Jersey City, and were taking instruction from its resident teacher, Rev. Robert Kennedy SJ, who had himself studied Zen under noted teachers Yamada Roshi in Japan, Maezumi Roshi in Los Angeles and Bernard Glassman Roshi in New York. In 2003, several of the founding members had left to form other Zen sanghas in their own vicinities, or to train in the intricate rituals of the Zen priesthood. However, Carl Bachmann remained to organize the Clear Mountain Zen Center, and to maintain a Zen community presence in Montclair. 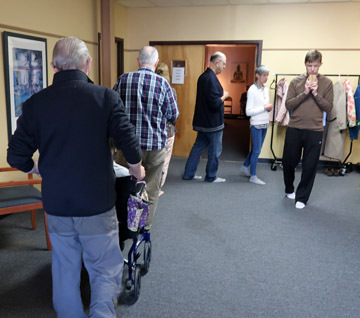 By 2005, with the help of Jeff Kuschner, Densu, the Clear Mountain sangha found a new home in downtown Montclair, in a rented storefront across from the re-developed former Lackawanna Railroad terminal. This eclectic, ethnically diverse neighborhood includes a Bikram Yoga studio, an interior design business, a gym, a cab company, a child learning center and several other residential buildings. In January of 2017, the Clear Mountain Zendo left our former home on Lackawanna Plaza for a suite within "The Mill at Walnut Street" professional center, a former knitting mill that was converted to office space. This building is near the NJ Transit Walnut Street train station on the Montclair-Boonton Line. Today, under the leadership of Sensei Bachmann and with the continuing guidence of Roshi Robert Kennedy, the Clear Mountain Zen Center offers itself to all who wish to follow the path of Zen practice. We welcome all, regardless of formal faith affiliation or lack thereof. Our members come from a broad range of backgrounds from young to old, including artists, retirees, students, service workers, attorneys and other professionals. In early 2011, we lost a long-time faithful member as Hy Meador passed away. Clear Mountain is a member of the White Plum Asanga lineage. White Plum is a Zen school that was formed in the late 1970s from the inspiration of the late Hakuyu Taizan Maezumi Roshi, a master from Japan who founded the Zen Center of Los Angeles in the 1960s. Maezumi Roshi was a successor in three different lineages of the Soto as well as the Rinzai school, thus expressing the teaching of the Buddha and the traditions of Zen in a wide, far-ranging fashion. The White Plum concept was fostered and made concrete by Tetsugen Bernard Glassman, Roshi, who became the Asanga's first President. Today, the White Plum Asanga encompasses a myriad of local practice communities located thoroughout the United States and Europe (stretching from San Diego, California to Warsaw, Poland with an outpost in New Zealand). 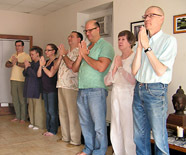 In keeping with the broad vision of its founders, White Plum teachers today reflect the wide range of styles found in American Zen, including community activism, family support, secular and ecumenical diversity, artistic expression and the preservation of the great teachings and rituals of the Eastern masters. While pursing our local identity and celebrating the uniqueness of the Montclair area community, Clear Mountain sangha members also cooperate with and support the activities of other local Zen sanghas. These include: Morning Star Zendo, Jersey City; Empty Bowl Zendo, Morristown, NJ; the Heart Circle Sangha in Ridgewood, NJ; and the Moon Water Sangha of the Empty Hand Zen Center, which presently meets in the evening for zazen at our Zendo location as well as in Basking Ridge, NJ.